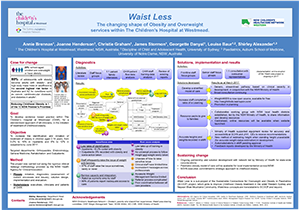 The Waist Less project aims to improve clinical processes and resources at the Children’s Hospital at Westmead (CHW), to increase the identification and management of children with obesity and their families. It is part of the Sustainable Connections for Overweight and Obesity in Paediatrics (SCOOP) project, which aims to develop streamlined models of care and health pathways for children with obesity and their families within primary, secondary and tertiary healthcare settings in Nepean Blue Mountains and Western Sydney Local Health Districts, improving equity and access to care. To increase the identification and initiation of treatment of obesity in children aged 2-14 years, from 0.2% to 10% in inpatients and 6% to 12% in outpatients, by June 2017. Increases the accuracy of reporting, to support Activity Based Funding. Increases staff knowledge of and confidence in treating childhood obesity. Enhances collaboration of services across the hospital. Supports early identification and treatment of childhood obesity. Improves outcomes of children with obesity and their families. Improves referral and monitoring processes for childhood obesity. Childhood obesity is a significant problem worldwide. In Australia, approximately one quarter of school-aged children are overweight or have obesity1. Eighty percent of adolescents with obesity are likely to remain in this category into adulthood without intervention2. Obesity and being overweight in adulthood is the second highest risk factor for conditions such as cancer, cardiovascular diseases and diabetes—higher than smoking3. The rates of children living in Western Sydney who are overweight or have obesity are among the worst in NSW4. Childhood obesity is one of 12 NSW Premier’s priorities for action, reflecting the importance of this enormous public health issue. However, despite children with obesity presenting to medical services more frequently than children of normal weight status5, obesity is not well assessed or managed at many healthcare facilities. In data captured over the course of one day at CHW in 2016, only 12% of inpatients and 31% of outpatients had their weight and height measured together. It’s important to take these measurements at the same time to determine whether the patient is in a healthy weight range, as weight status is difficult to determine visually. Furthermore, in the three highest referring departments to the Weight Management Service (WMS) at CHW, less than 0.2% of inpatients within a six-month period and 6% of outpatients in a one-week period were identified as having obesity, with action taken to start treatment (such as a referral to a weight management service). This means the vast majority of patients who have obesity were not receiving care for this serious and chronic condition. For inpatients, a lack of identification and action can impact funding, as correct coding determines the level of funding the hospital receives for that condition, and a patient is only coded as having obesity if it’s clearly identified and action is taken. These missed opportunities to identify children who are above a healthy weight means many do not get treatment until they have very severe levels of obesity and need to be referred to a multidisciplinary, tertiary-level clinic. The WMS is the only service of this type in NSW and is overwhelmed by demand. Referrals have increased more than three-fold over the past 10 years and as of July 2016, there was an eight-month wait for the program. By identifying children who are overweight or have obesity at an earlier stage, treatment can be provided by local clinicians, which provides children with timely and appropriate care for their condition. Extensive data audits, focus groups, interviews and surveys were conducted with staff and patient families to discover the root cause of the problem. As of February 2017, the following solutions are in the process of being implemented. An integrated model of care has been developed that will provide a streamlined pathway for childhood obesity management, based on clinical severity. An existing online learning program (Weight4KIDS)6 was updated and made more accessible to health professionals. This module outlines the correct procedure for measuring weight status in children, provides information on how to raise the issue of obesity with families, and outlines appropriate management for children with obesity and their families. Referral forms to WMS and other supporting services will be simplified, to make it easy to follow the model of care and refer the patient to the correct service. alert the clinician if a child is above a healthy weight and action needs to be taken. A collaborative working group has been established with the NSW Ministry of Health and other interested NSW local health districts, to share information and resources. A method for estimating height, and hence determining weight status when a standing height is not available, is being developed so that weight status can be estimated in a larger number of children. a website aimed at health professionals which houses the above resources in one easily accessible place. determine which equipment supports statewide recommendations and ensure they are added to the state equipment contract. The General Medicine, Orthopaedics, Rehabilitation and Endocrinology Departments at CHW. development of a model of care with consensus on its suitability. Defining and adhering to the scope of the project is very important. The CHR framework is a helpful process to follow. Although the timeframes of the CHR program are suited to smaller projects, large projects can be achieved by creating multiple project streams, where one can act as the CHR project and other streams can apply the knowledge and skills gained from the program. Creating an environment of knowledge-sharing among stakeholders and affiliated organisations ensures that existing skills and resources can be harnessed so we don’t ‘reinvent the wheel’. Australian Bureau of Statistics (ABS). Australian Health Survey: Updated Results, 2011-2012 (cat. no. 4364.0.55.003). Canberra: ABS; 2013. Lifshitz F. Obesity in Children. Journal of Clinical Research in Pediatric Endocrinology 2008; 1: 53-60. Australian Institute of Health and Welfare (AIHW). Australia’s Health: The 14th Biennial Health Report of the Australian Institute of Health and Welfare. Canberra: AIHW; 2014. Centre for Epidemiology and Evidence. HealthStats NSW. Overweight and obesity in children. Sydney: NSW Ministry of Health; 2016. Cretikos MA, Valenti L, Britt HC & Baur LA. General practice management of overweight and obesity in children and adolescents in Australia. Medical Care 2008; 46(11): 1163-1169.